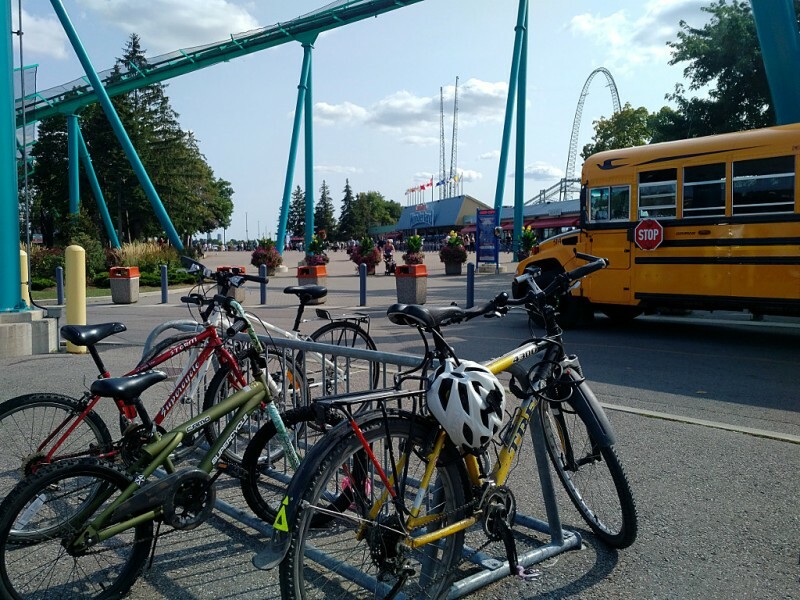 My co-workers and I headed up to Vaughan for a day of funteam-building exercise at Canada’s Wonderland last week. Like all kids in the ’80s, I used to go to Canada’s Wonderland every year—but always by bus or car. 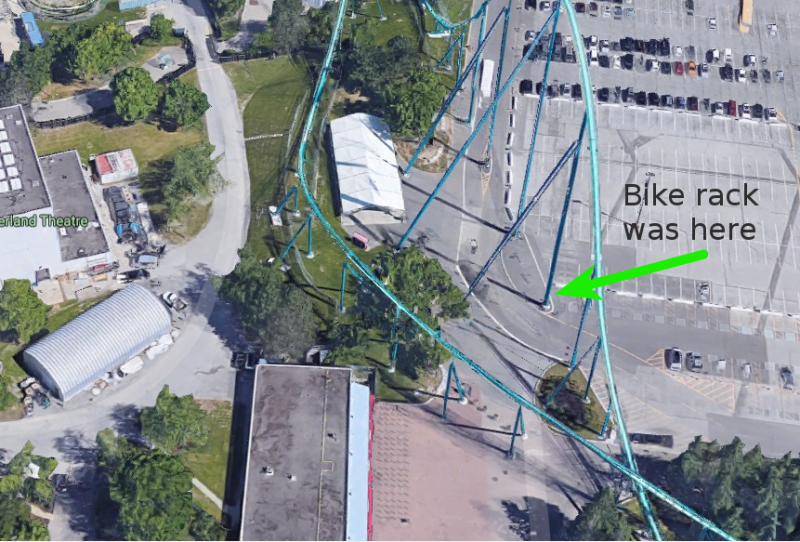 But now that Canada’s Wonderland is surrounded by suburbs rather than farm fields, I thought that maybe I should ride my bike up there, through the city all the way. Everyone I mentioned my plan to thought I was crazy. “They don’t like bikes up there,” was the typical response, usually accompanied by a slow head shake as if they were warning me to stay out of a rowdy bar. But hey, if I can’t ride to the rides, I don’t want to go. Besides, I regularly ride the mean roads of suburbia when I go on long-distance rides out of the city. Still, this felt different. I needed a bit of planning. Do you have any bicycle parking? Thank you for contacting Canada’s Wonderland. Unfortunately, we do not offer bicycle racks to lock your bike with. I hope this helps, please do not hesitate to contact us again. Seriously? 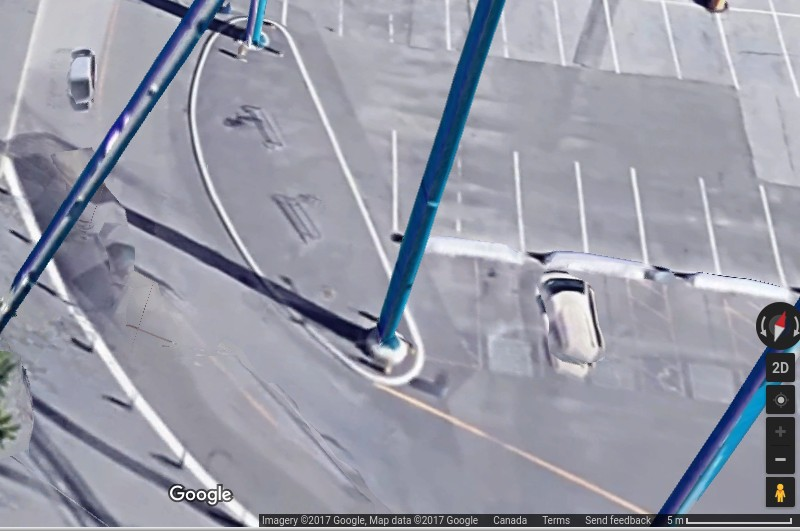 One-third of the park is given over to a parking lot for cars and there isn’t a single bike rack there somewhere? I didn’t receive another response. Well, this isn’t off to a good start. After all of the warnings from friends and family, after the assurance from customer service that I wouldn’t find a bike rack, and after the satellite-fuelled research, I set out on a sunny morning last week to meet my teammates at the theme parkconference center for our day of thrill ridesimportant meetings. And you know what? The ride was actually really nice! 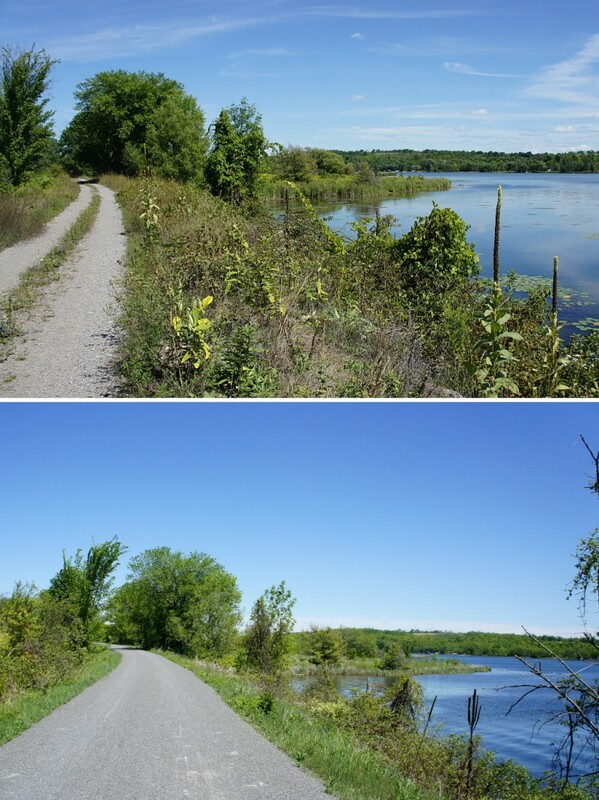 A surprisingly large portion of the route north of the 401 is on trails through parks. 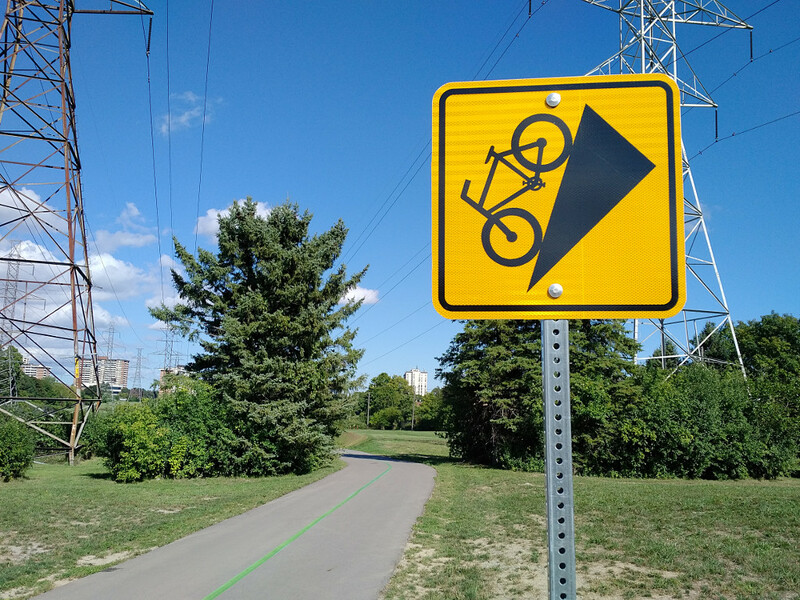 By far the worst part was riding on Bayview between Lawrence and York Mills, a stretch of road I’m all too familiar with. Even the relatively short ride along car-friendly highway Rutherford Rd in Vaughan wasn’t bad in comparison. The only glitch I encountered was some construction that closed part of the bike trail, forcing me out onto Dufferin to get past the 407. There’s a beautiful bike lane on Dufferin north of Steeles that, sadly, ends just when it would be most useful: crossing the 407. Would I do it again? Absolutely! 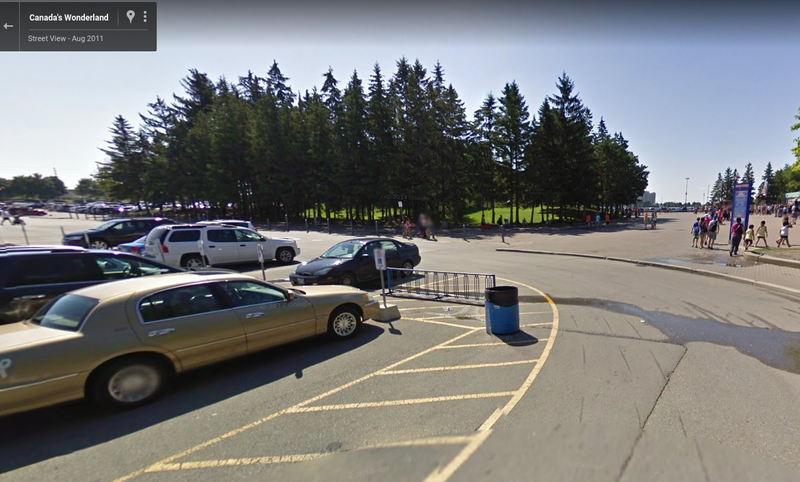 It’s no worse than any other ride out of the city, and the joy of riding through a gargantuan parking lot to my—free!—parking right beside the entrance is always one of the joys of cycling to a destination. That said, the ride reinforced a long-standing problem with cycling infrastructure in and around Toronto: the optimum route is so hopelessly convoluted that you couldn’t hope to follow it without a good GPS and/or mapping app. 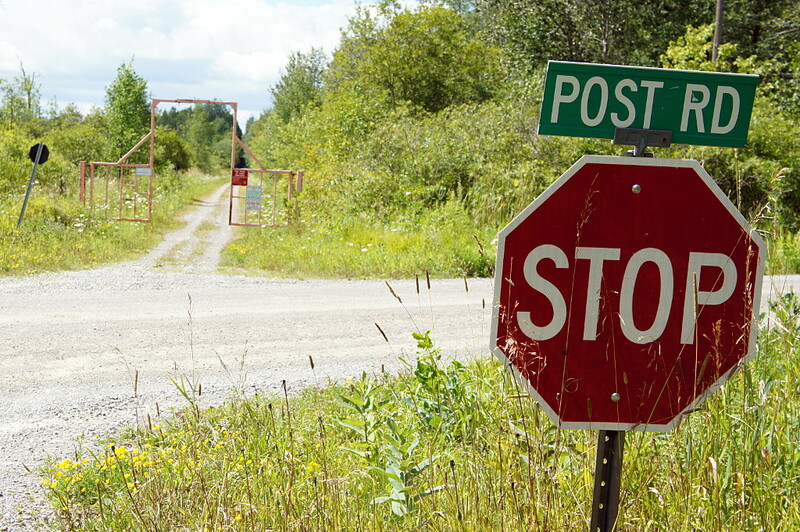 If you want to get there in a car, you can just hop on the 400 and follow the signs; wouldn’t it be great if there was a signed route from the Finch hydro corridor to Canada’s Wonderland? The route is already there; now we just need the signs. Instead, you’re left cycling on a dead-end street, hoping that the GPS is right and there’s a trail at the end (there always was). Or assuming that the barely-visible gravel path beside the driveway actually goes somewhere (it did). As good as the ride was, it shouldn’t take so much effort to figure it out and keep track of it while you’re on the go. Yeah, that’s more like it. Toronto signs, the latest in a continuing series. That’s me in my new Quest velomobile, with my DF and Alleweder behind me. In my dreams, at least. 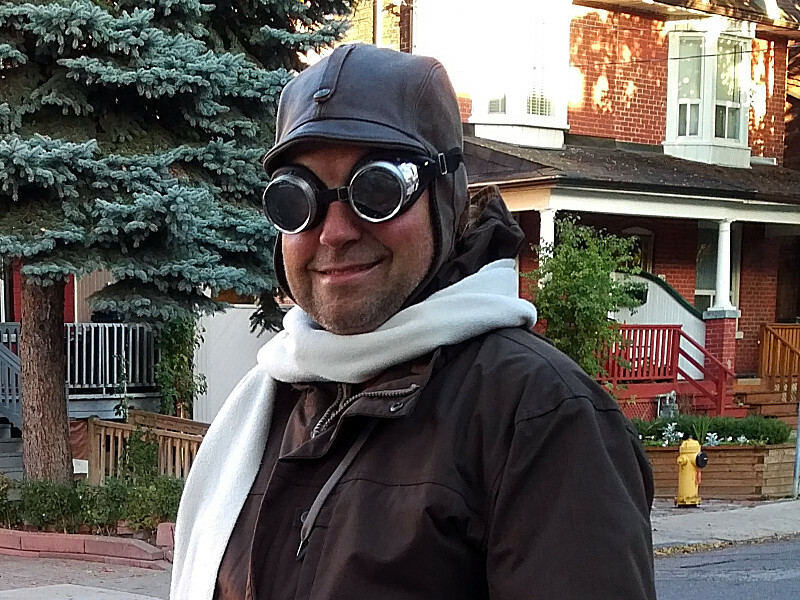 In reality, I stopped by Bluevelo for a test ride in the Quest when I found myself in Collingwood last summer. And what a ride it was. Bluevelo’s owner, Randy, accompanied me in the Alleweder as I piloted the Quest for an hour-long ride through the rolling countryside around Collingwood. Although I’ve lusted after the Quest for several years, it was my first time actually sitting in a velomobile. Indeed, it was my first time riding a recumbent. Hell, it was even my first time on a trike in nearly 40 years. 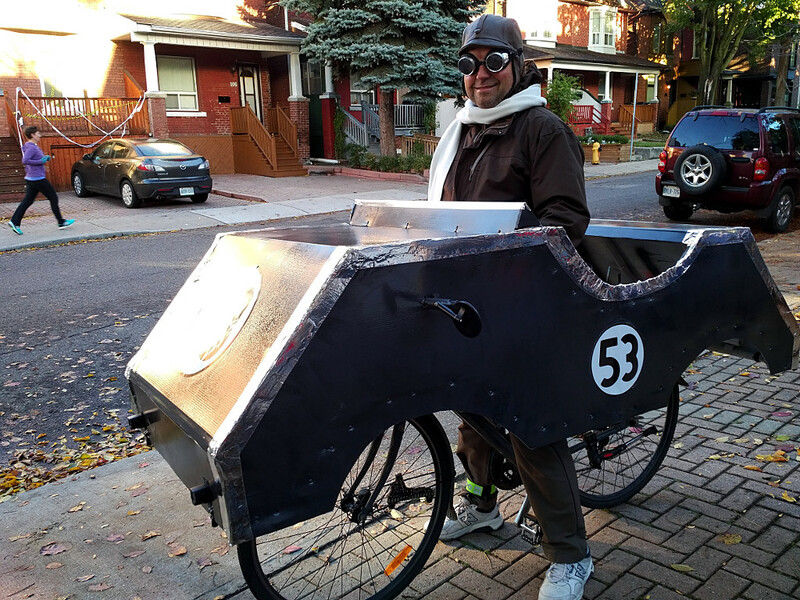 And the Quest is a lot more sleek than the trike I used to power along East York sidewalks in the 1970s. Randy and I set out on a warm sunny morning, first winding our way through local traffic and an industrial area before hitting the open roads just outside town. Riding a recumbent is all kinds of different from an upright bike. You grow accustomed to the sitting posture quickly enough, but leg muscles that are used to pushing down on pedals in a particular way take a little while longer to adapt to the legs-forward position. I thought my legs were going to fall off when we rounded the first corner, barely a couple of minutes into the ride. But it got better from there. The steering felt a lot more twitchy than I’m used to. I’m sure it’s just a matter of getting used to the steering tiller and using two front wheels instead of leaning to control my direction. I was already riding more smoothly by the end of my hour-long ride so the twitchiness would probably be gone entirely after a couple of days of regular riding. It’s heavy. No amount of aerodynamic fairing will help you climb a hill. I’m used to pulling a heavy trailer up all kinds of hills on loaded tours and I found the Quest’s 70-pound frame to offer a comparable experience. On the upside, you can go as slowly as you need to because you don’t need to maintain your balance. Feeling the weight on uphills and when starting from a dead stop would be a bit of a culture shock to a roadie. Chain slap. Shifting gears at speed sometimes resulted in big waves traversing the length of that long chain from the crankset at the front to the cassette all the way at the back. I’m used to making soft shifts on my upright bikes by easing off the pedals a bit when I hit the shifter but found that I had to be much more conscious about the technique in the Quest. Again, I’m sure that it becomes second nature once you’ve ridden it for a few days. And that was basically it; I’d catalogued all of the negatives and idiosyncrasies within a couple of minutes of pedalling away from the shop. The rest of the hour was spent marvelling at the wonders of the Quest. Although the weight makes it slower to accelerate, the full fairing and low-to-the-ground posture mean that once you’re going, you can keep going with little effort or really fly with just a little more. And fly I did. I never did much more than turn my legs at a steady pace but ended up with an average speed slightly higher than I would have gotten if I’d done the same route all-out on my road bike. The aerodynamic shape is incredibly good at maintaining speed when you coast. And I coast a lot. 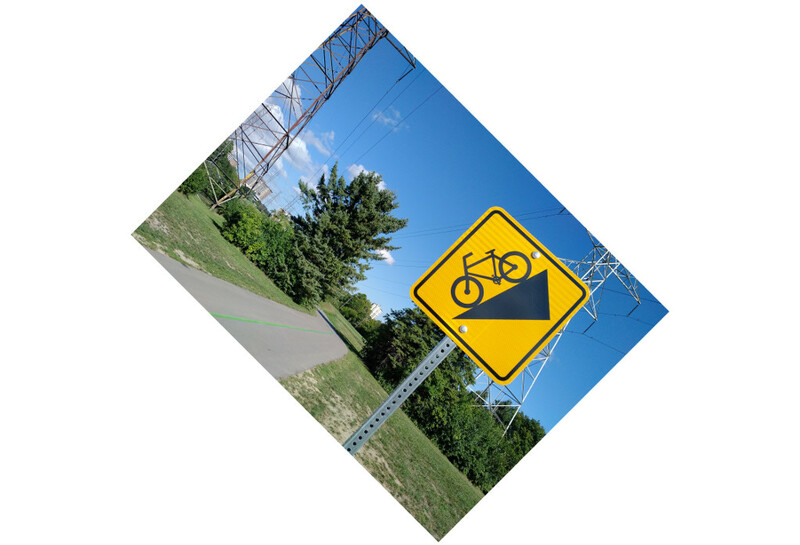 Going up hills was undeniably more difficult in the Quest than on a road or mountain bike, but it was far easier to maintain higher and more consistent speeds on the flats. As for downhills, they’re ridiculous amounts of fun: push a bit at the top and you feel like you’re going to take off by the time you get to the bottom. If you get going fast enough, the inertia can take you over the next roller so quickly that you don’t even notice you’re climbing. I could definitely get used to taking the Quest for a spin through the countryside. Which raises the question…no, I haven’t bought one. Yet. I spent a full two hours at Bluevelo that day and the pitch is compelling. I went in expecting (maybe even hoping) to find some kind of deal killer but every time I said, “Yeah, but what about <X>?” Randy had a great explanation. I’m probably not going to buy one this year, but I can definitely see one in my mirror, slowly reeling me in. 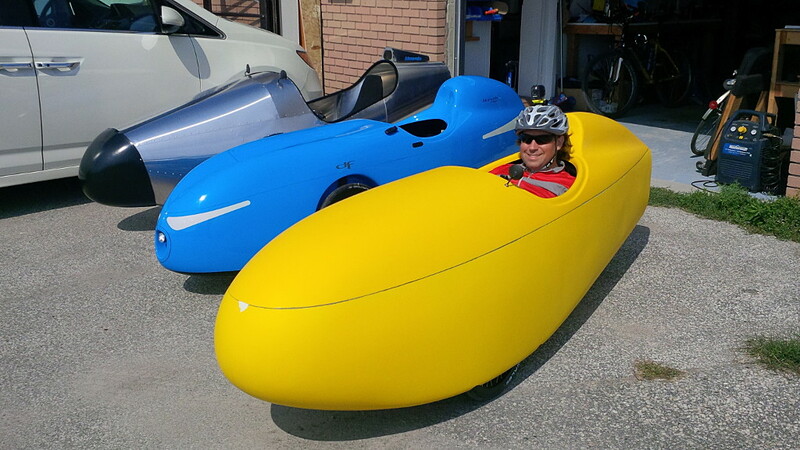 The only question is whether a velomobile will be my next city bike or my next touring bike. Kingston to Cobourg, Day 2: Blow the man down! 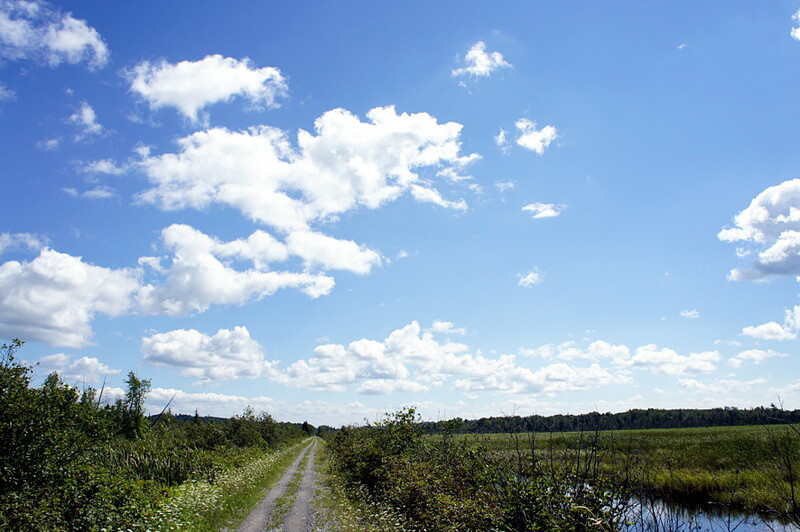 The Millennium Trail in Prince Edward County. Nothing gets you going in the morning like a hearty French toast breakfast, and Magnolia Meadows host Isabelle didn’t disappoint. An hour after polishing off a stack of French toast, a pot of tea, and a glass of juice, I was ready to hit the road again on Day 2 of my mid-July ride from Kingston to East Dodgeville. It was just a bit cooler than it had been the previous day, but still uncomfortably hot as I got underway shortly after 10 a.m. But the killer this day wasn’t the heat or the humidity; it was the wind. Blowing briskly from the west at a steady 40 km/h (and gusting to 60 km/h), Old Man Wind’r would be my nemesis for the next few hours as my route took me straight into his gaping maw. 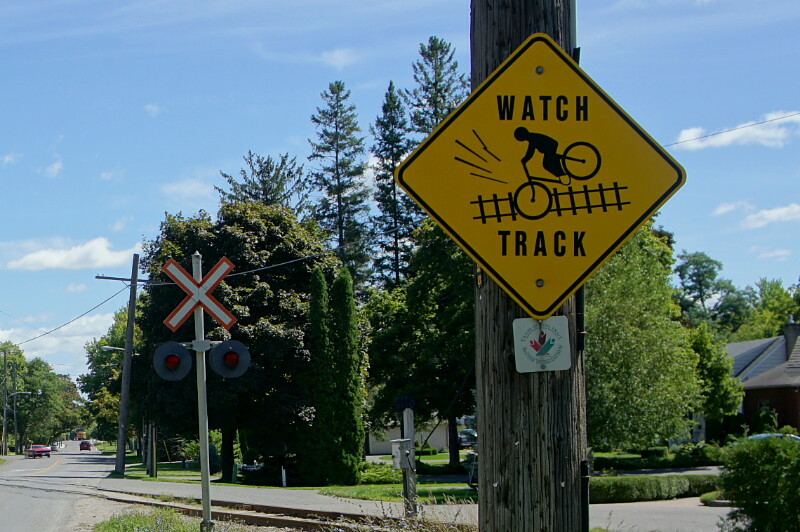 The Friday ride was to start with a short stretch along the main rail trail in Prince Edward County, the Millennium Trail, before moving onto local roads for the majority of the ride into Cobourg. I joined the trail a short distance north of the B&B. I’ve shared trails with dirt bikes, ATVs, and even full-sized touring motorcycles, but this was the first time I’ve ever had to share a rail trail with golf carts: in Wellington, the trail goes through a golf course and carts zip onto the trail for short distances to get to the next hole. Fortunately, it only takes a couple of minutes to get past the course and I only saw a couple of carts. 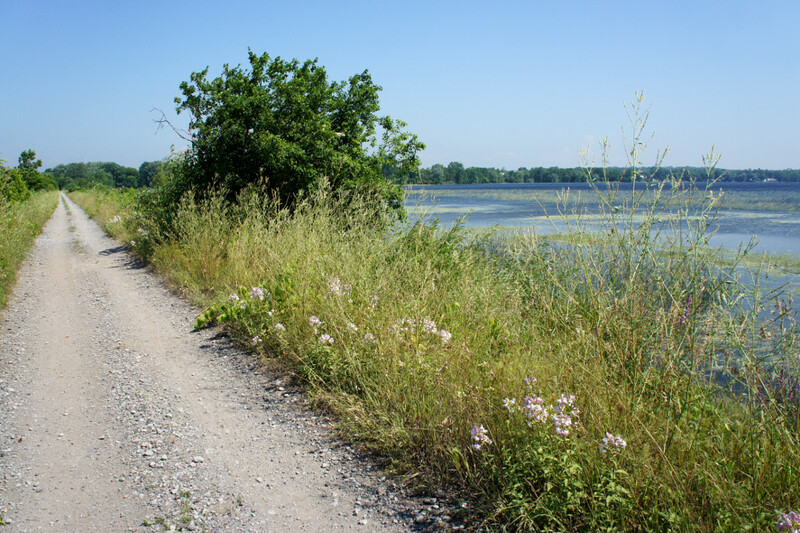 A causeway carries the Millennium Trail across Consecon Lake. I hope there’s a bridge at the far end. This day’s route called for me to stay on the rail trail for 3-4 km and then venture back onto the roads for the rest of the day. But with the open road came my first taste of the headwind that would bedevil me for the rest of the day. After a few minutes, I scurried back to the trail and the sheltering vegetation lining both sides and keeping the wind to a minimum. Although the trail surface varied from smooth limestone dust to sandy double track and large gravel, it was far easier to maintain a good pace on the rail trail than to battle the wind. Being beaten back to the trail turned out to be a blessing in disguise because the Millennium Trail was easily the best part of the ride on either day. The wind was controlled, the scenery beautiful, and the trail was wholly deserted: I didn’t encounter a single person on the trail after I passed the golf course on my way out of Wellington. The only problem: at one point, my GPS and my printed Google maps disagreed over whether the trail continued across a bridge over Consecon Lake up ahead. Should I keep going on the trail or return to the road grid to get around this potential dead end? I decided that I’d rather have to double back on the trail than ride on the road if I didn’t absolutely need to, so up the trail I went. In the end, Google was right: the trail followed a causeway out across Consecon Lake and an old bridge did indeed span the gap that my GPS showed. And the bridge was a little more confidence inspiring than it was in 2004. Most of the Millennium Trail isn’t in good enough condition for casual cyclists on hybrid or city bikes, but it’s a easily ridable on anything with wider tires. It was a pleasure to ride on a front-suspension mountain bike, but rigid forks and well-padded gloves would have done just as well. The entire trail northwest from Wellington is a great ride. 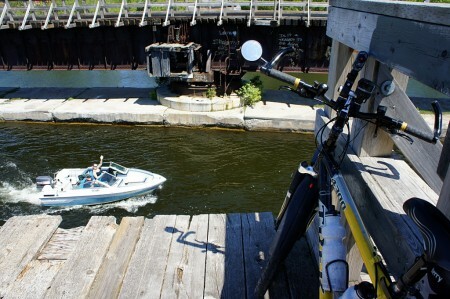 Next time, I’ll ride it all the way from the eastern end of the County in Picton. But all good rail trails must come to an end and I rejoined the road to cross the western end of the Murray Canal outside Brighton. Away from the busy Loyalist Parkway, the crossing at this end of the canal is much quieter and allows you to skirt Brighton rather than going through the town on major streets. 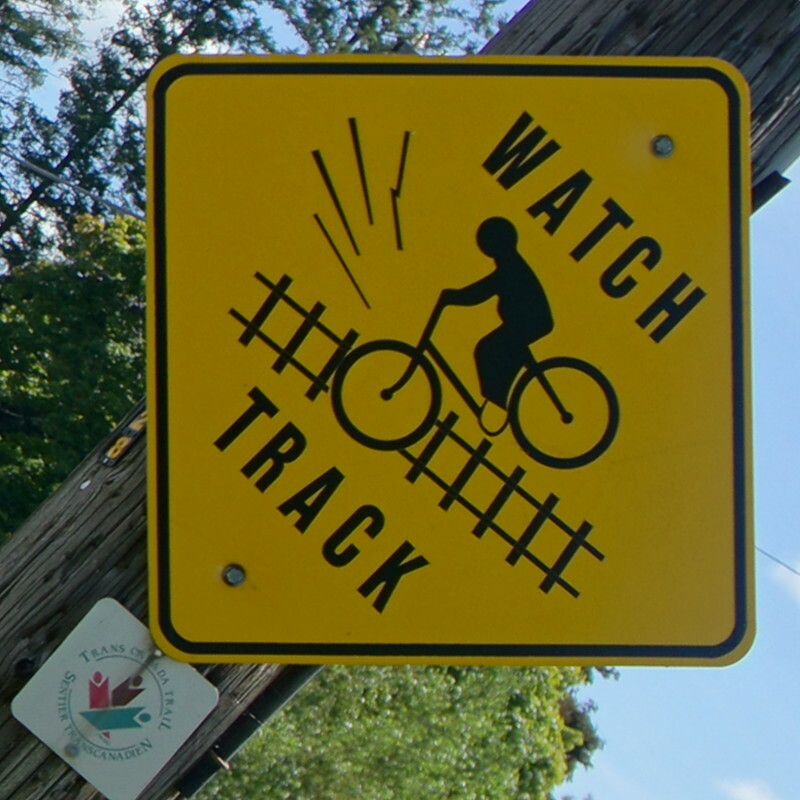 Highly recommended for all cyclists riding between Wellingon and Presqu’ile. Unfortunately on this day, with the open road came the fierce wind and the afternoon heat, kilometre by kilometre sapping my will to ride. 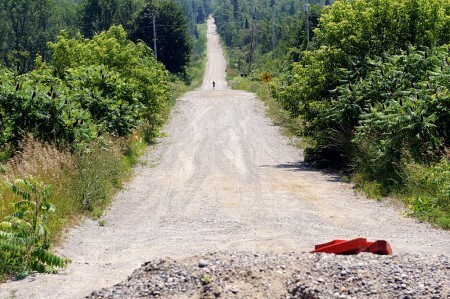 From the closed bridge on Barnes Road, a lone jogger plods down the deserted and very hot road. I rode through the south end of Brighton, past Presqu’ile Provincial Park and toward Cobourg, my target for the day. I wanted to stick as close to the lake for as long as possible before joining the main road to Cobourg, so I took a chance when I saw a “bridge closed” sign directing me up to the highway as a detour. It meant I’d be rolling the dice for a second time in one day on a potentially non-existent bridge, but what the hell; at least I’d have a tailwind for a few minutes if I had to backtrack. Two and a half kilometres after the sign, a gravel barrier blocked vehicular access to the railway overpass on Barnes Road, but it was obviously still well-used by pedestrians. 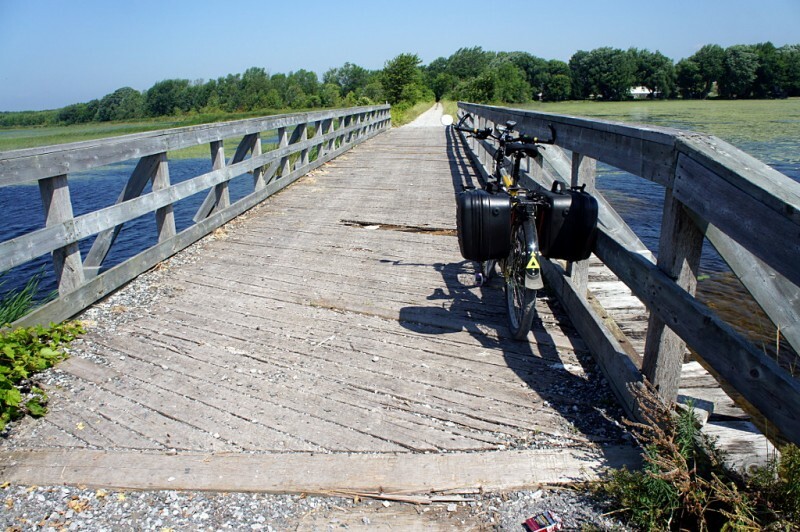 I hefted my bike over the pile of gravel and sat down for lunch on the bridge, just a few hundred metres short of the road to Cobourg. At this point, it was clear that finishing the ride all the way to Cobourg would be a serious challenge. Although this day’s ride was planned to be around 25 km shorter than the previous day’s, the wind was taking so much out of me that it might as well have been 50 km longer. As I turned onto the main road west to Cobourg and back into the full-on headwind, I knew I was defeated. I slogged through Salem, Colborne, and Wicklow before finally succumbing to the heat and wind at Grafton, calling Risa to pick me up about 15 km short of our planned meeting place in downtown Cobourg. By that time, my pace had been slowing down so steadily that my GPS had been declaring Cobourg to be just an hour away for the previous 45 minutes. I’d definitely do the entire ride again if I had the chance, but I’d order up cooler weather and a much lighter breeze next time. And barring that, I’d head east with the wind, rather than west into it. That said, I highly recommend the entire route I took. 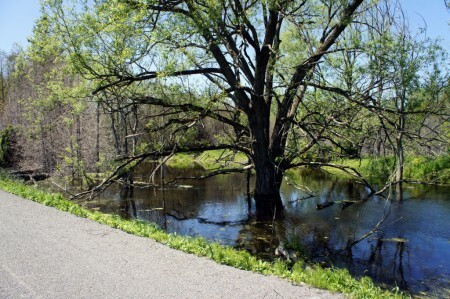 I’d make more detours with more time and more bike-friendly weather, but the route was an excellent combination of being away from traffic on backroads and quiet trails, together with scenic highways when necessary. If I’d been on a road bike, I would have had to stick a little closer to civilization for most of the second day. It’s one reason that I like doing tours on my mountain bike: it can be a bit more challenging if I’m just riding along paved roads, but it gives me a lot more freedom when it comes to selecting a route and making detours along the way. I bracketed this ride with a bus trip to Kingston and a car pickup in Cobourg, but the trip could just as easily have started with a train ride to Kingston and ended at the Cobourg VIA station for a ride back to Toronto. Or add an overnight stay in Cobourg and a third day of riding to the GO bus in Newcastle or GO train in Oshawa. The gallery from the ride is below the fold. 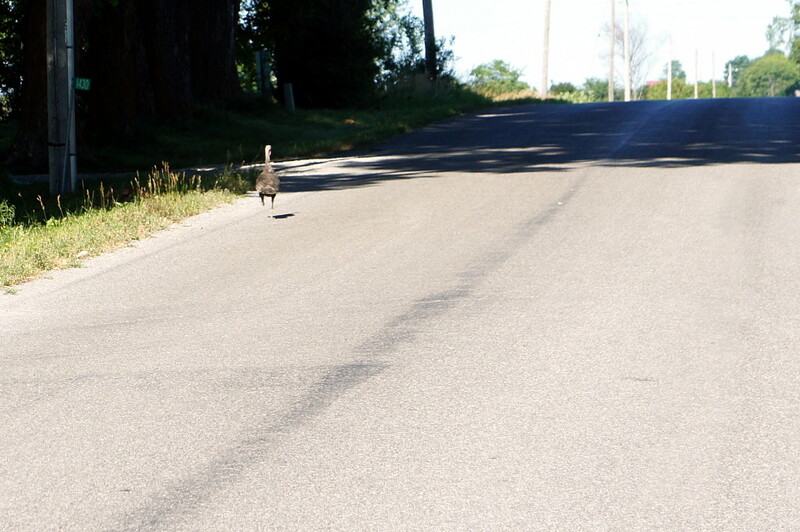 Near Millbrook, two domestic turkeys were foraging at the side of the road when I cycled by. One ran straight back into its field while this one ran up the road to the driveway and then ran up the driveway to the barn. Neither one took any notice of the car that passed by a few seconds earlier. So why did the turkey cross the road? 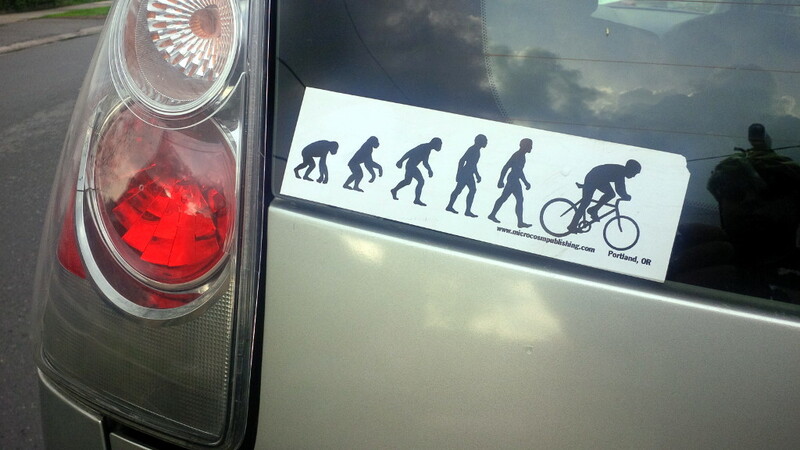 To get away from the cyclist. Not only does this cyclist exhibit some seriously flawed technique, but he’s suffering a major mechanical malfunction too: those shattered rods flying in front of him must be the missing top tube and chainstays from his bike. The perils of crappy carbon frames. Poor Mr. Stickman. He’s out for his first (and likely only) spin around the block this year, just trying to work off his winter fifteen and disaster strikes! I’m not even going to try to figure out what happened to his feet.